The Apple iPad mini might just have landed in stores, but Apple’s manufacturers are already gearing up for a Retina-display second generation of the iPad mini, according to sources from China. AU Optronics in particular is said to expect to kick off mass production of 2048 x 1536 resolution 7.9-inch screens by the second half of 2013. While on the 9.7-inch iPad that meant a high pixel density of 264 ppi, on the iPad mini, this would work out to be a mind-blowing display, a candy for your eyes with a pixel density of 324 ppi. We don’t know why Apple did not ship this first generation of the iPad mini with such a display, but our guess would be price. Working it all out for the second-gen, it seems the company will bring its game up a notch. It seems that Apple will continue with its disciplined yearly rollout of new generations of products, and that an iPad mini could come around Q4 2013, but not earlier. A higher-res display would also mean a beafed up processor to go with it. That would simply be a huge update at that price point, but we don’t really doubt Apple is going that way. The real question seems to be when. Epic fail, ppi on 2048x1536 7.9inch screen is ~324, not 497 Even the source (SlashGear) said so. Yup...too little too late for Apple! its a good addition but there are already higher res screens existing now so by second half of 20113 we may have Nexus 10 resolution screens on 7 inch devices....and Apple's retina display will have failed them yet again. And by the way does Apple have a standard on Retina display or do they just label any device in their line-up that they like as Retina Display? I mean iphone 4s has 326 ppi, the old new ipad and the new new ipad :) have 264 ppi, the retina macbooks have lesser ppi...so what the heck is all the fuss about? 20113? Wow man...you are really going far! I doubt Apple will live to see that year (pun intended). LOL, By looking at their stock price in reasent time, I really doubt that they will not stay in the market till Q1 2015. Ur mom givin birth 2 u was and still is a fail, EPIC FAIL that is. I think the reason for not putting the retina display is not only the price, they need a good CPU\GPU muscle like A6 or A6X. As we know Apple does not have enough inventory for A6 chips for their iPhone which the highest profit margin product for Apple. So it is unlike they will make iPad mini with retina display anytime soon. This means that the 9.7 inch ipad will get an even bigger upgrade! Heal yeah! I think it will have a true retina display (300 ppi), a much better processor (probably A15 based dual core), and an upgraded OS. Now you can wait 5-12 months for this Ipad to be released, and get it for $600, but for $299, I can get you it next month, with a better OS. It just might be called the Nexus 10 instead of the iPad 5.
anyway, by the way, busway, railway, the fail and the failure are still epic! Let me see, except for the 2048 x 1536 resolution and processor, i won't be entirely wrong to predict that the next iPad mini will look the same, feel the same and sound the same. And continue patenting everything on it's way...thinking it's innovation they created. Hate me for the words but i got no more love for Apple. Why would you change a good thing for the sake of change? People love the form factor and build quality of the Mini. It is a hit. 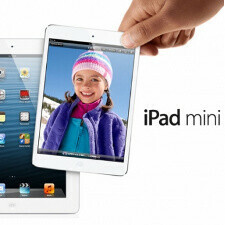 Put the iPad 4 screen and internals in the Mini, and you will have a huge hit. People love the form factor and build quality of the Mini. It is a hit." How many times have you people been saying that?? You might as well say "People love the form factor and build quality of the iP5. It is a hit." You know what it sounds like? A CLICHÉ! As boring as the iPads and iPhones can get. And by the way, are you saying that those iPad and iPhone designs are the best that Apple can come up with? You definitely sound so... P.S. Those thumbs down are not mine, don't believe me? Check my finger-print. I don't care about the thumbs down on here. If you say anything positive about Apple, then they come with the territory. As far as design, the iPhone is iconic. People buy it because they like the design. You iterate the most popular design on the planet. Constantly changing it risks alienating the people who love it. You upgrade the internals, and improve where improvement is needed (Glass-->Aluminum), but just changing it is a recipe for disaster, from a business standpoint. Okay, here's a question. Why not have simply waited a few months and release an ipad mini WITH the retina display? How is this any different than releasing a smartphone without sms capability and then adding it in their next iteration, when the current crop of cell phones (smart & feature) had the capability for years before when the first was released? It's not like that was a new technology, and neither is a retina display. If anything it should have been easier to get retina resolution on a smaller display. To me this is as bad as people who trade in their 1 year old car for a new one because it has a world clock instead of a regular one. And yes it does happen. When they already have a new model in the wings before the original has been out for a month, all that is is a pure money grab. Android oems have done it and I felt the same way about it then (Bionic/Razr/Razr Maxx/Razr MaxxHD). All it shows me is that they really don't have anything for the next model and are using it as a stopgap to buy time to think up something new. But what it really does is screw over loyal customers. But I guess if you continue to let them do that it's your own fault.